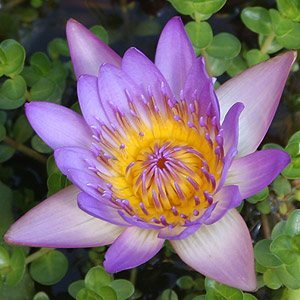 The Blue Lotus water lily is one of the most sought after water garden plants. The botanical name is Nymphaea caerula it is commonly known simply as the Blue Water lily and also Lily of the Nile. Despite the name this attractive water garden plant is a actually a water lily not a lotus at all. It is grown widely in water gardens across Australia, and as this is a fairly easy plant to grow, it is best suited to growing in a pond, however a large container may also work. All lotus like water that is fairly still, they do not grow well in moving water. They are best kept away from fountains and do not grow well in most water features. You will need a sunny position, 6 – 8 hours of sun each day is ideal. They grow best in a container submerged in the pond on a shelf. All lotus need to be planted so that the foliage is on the surface. Fertiliser can be applied directly to the growing container in summer. Blue lotus flower from spring through summer, they are dormant in winter. A plant native to Egypt where it grows along the banks of slow moving rivers including parts of the Nile. Said to represent the origins of life it has mid green rounded leaves star shaped double flowers that opens to reveal a yellow center. So in fact the ‘Blue lotus’ is in fact a water lily better suited to large ponds. 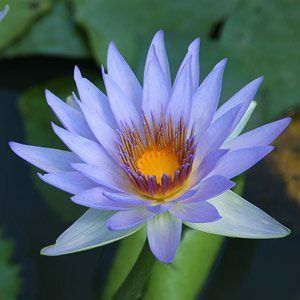 However it does get a little confusing as Nymphaea nouchali from India is also known as the Blue water lily and Star Lotus. This is a sub tropical species that can be grown in a container or pond. Full sun and shallow water at around 30cm. This one can be grown in cooler climates, does well in Melbourne. So we have two plants that are grown in ponds and water gardens that are commonly referred to as Blue Lotus, both are actually water lilies. Flower colors will vary from pink to mauve and truer blues depending on the variety.